I have many more comments pending on my observations from the recent AUVSI/TRB Automated Vehicles Symposium, but for today I would like to put forward an observation I made about two broad schools of thought on the path of the technology and the timeline for adoption. I will call these the aggressive and conservative schools. The aggressive school is represented by Google, Induct (and its successors) and many academic teams, the conservative school involves car companies, most urban planners and various others. The conservative view sees this technology as a set of wheels that has a computer. The aggressive school sees this as a computer that has a set of wheels. The conservative view sees this as an automotive technology, and most of them are very used to thinking about automotive technology. For the aggressive school, where I belong, this is a computer technology, and will be developed — and change the world — at the much faster pace that computer technologies do. The conservative view sees robocars as an automotive technology. For the aggressive school, this is a computer technology, and will be developed — and change the world — at the much faster pace that computer technologies do. Neither school is likely to be entirely right, of course. It won’t go as gung-ho as a smartphone, suddenly in every pocket within a few years of release, being discarded when just 2 years old even though it still performs exactly as designed. Nor will it advance at the speed of automotive technology, where electric cars are finally getting some traction a century after being introduced. The conservative school embraces the 4 NHTSA Levels or 5 SAE levels of technology, and expects these levels to be a path of progress. Car companies are starting to sell “level 2” while working on “level 3” and declaring level 4 or 5 to be far in the future. Google is going directly to SAE level 4. The two cultures do agree that the curve of deployment is not nearly-instant like a smartphone. 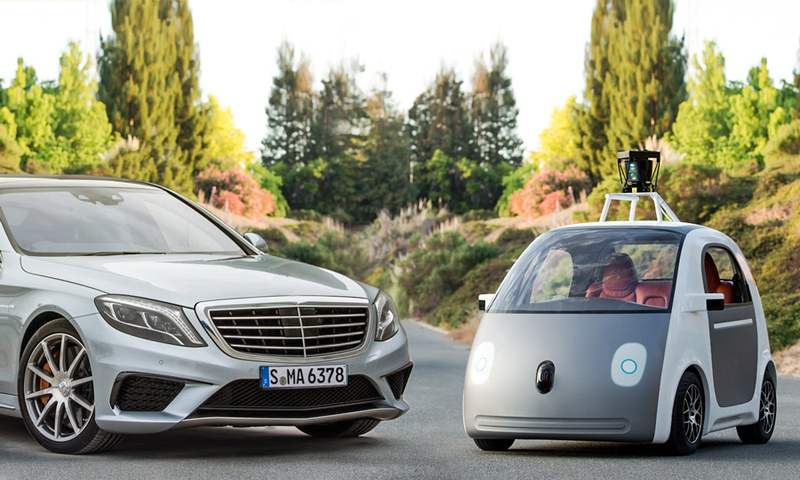 It will take some time until robocars are a significant fraction of the cars on the road. What they disagree on is how quickly that has a big effect on society. In sessions I attended, the feeling that the early 2020s would see only a modest fraction of cars being self-driving meant to the conservatives that they would not have that much effect on the world. In one session, it was asked how many people had cars with automatic cruise control (ACC.) Very few hands went up, and this is no surprise — the uptake of ACC is quite low, and almost all of it is part of a “technology package” on the cars that offer it. This led people to believe that if ACC, now over a decade old, could barely get deployed, we should not expect rapid deployment of more complete self-driving. And this may indeed be a warning for those selling super-cruise style products that combine ACC and lanekeeping under driver supervision, which is the level 2 most car companies are working on. To counter this, I asked a room how many had ridden in Uber or its competitors. Almost every hand went up this time — again no surprise. In spite of the fact that Uber’s cars represent an insignificant fraction of the deployed car fleet. In the aggressive view, robocars are more a service than a product, and as we can see, a robocar-like service can start affecting everybody with very low deployment and only a limited service area. The conservative and aggressive approaches to robocars will clash when it comes to deciding how to measure the safety of the products and how they should be regulated. This dichotomy is somewhat reflected in the difference between SAE’s Level 4 and NHTSA’s. SAE Level 4 means full driving (including unmanned) but in a limited service area or under other limited parameters. This is what Google has said they will make, this is what you see planned for services in campuses and retirement communities. This is where it begins, and grows one region at a time. NHTSA’s levels falsely convey the idea that you slowly move to fully automated mode and immediately do it over a wide service area. Real cars will vary as to what level of supervision they need over different times, streets and speeds, possibly even existing at all the levels at different times. Follow the conservative model and you can say that society will not see much change until 2030 — some even talk about 2040. I believe that is an error. The two approaches will also clash when it comes to deciding how to measure the safety of the products and how they should be regulated, which will be a much larger battle. More on that later. This post originally appeared on Robocars.